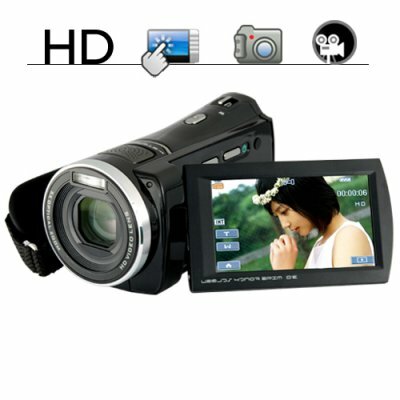 Successfully Added 1080p HD Camcorder with Touchscreen and 5x Optical Zoom to your Shopping Cart. HD Camcorder with Touchscreen and 5x Optical Zoom, recording video in 1080p resolution. Own a great video camera today at an extreme low wholesale price. Specifically designed for those people who want a high quality digital video camera with spec features (1080P, HDMI, 5X Optical Zoom, Motion Detection, Touch Display), but want to buy it at a direct from the factory budget price. Having a 3 inch flip out widescreen LCD touchscreen and high-def resolution, this unit will have you easily making movie quality videos in no time, and with its native HDMI output port you can instantly watch the videos directly on your home HDTV. With this HD camcorder your personally made videos will be clearer than you ever imagined, so whether you are a youtube enthusiast, citizen journalist, or the family camera man, your vids will look just as good as anything you normally see on TV or in the movies! While the most cameras have been advertised as an "average guy" series of camcorders (also called DV Cameras), this high end optical zoom HD camera really offers enough features to keep both the beginner and more advanced user busy and excited with its set of focused quality setting. With this model video camera you get all of the following; Video recording at up to 1080p resolution, Photos at up to 12MP, 5x optical zoom + 4x digital zoom, web cam function and much more! These are the features you might expect in the latest Sony and Canon cameras, and now you can finally get them in a factory direct OEM camcorder. Going on its third generation, the DV1 series continues to lead the way in features and ease of use. If you are in the market for a new video camera or are looking to buy a gift for your girlfriend/husband/favorite uncle, this one is the top choice. The DV14 is in stock in our warehouse right now and is being offered for single piece or even better priced stock orders. Click "Add to Cart" now and we will ship it out to you tomorrow! Brought to you by the leader in wholesale cheap video cameras, Chinavasion. I recieve it today, shiptime was fast. The camcorder is great, picture and video is very good. One thing, Iam missing the front "lens cap". It is now unprotected, ok, it sitting in the bag.The rest of the camcorder is ok. Thanks Cv again for the great offer. Bueno pues en 7 compra como siempre genial, 4 fias por ups, apariencia muy buena, manejo muy sencillo puero completo, sin estupideces en el menu que nunca usaremos, estabilizador muy bueno y calidad de imagen muy buena tambien, tamaño ridiculo, como un vaso de tubo pero mas corti, es genial. I was totally blown away by this camera. The features are awesome and although the camera is compact in size, it is great at capturing moments and still photography. The only part is not being able to hear the playback because the microphone has been designed and put only at the top of the camera. The flip feature of the LCD is great and the 1080 HD is amazing. Really glad I got this item.